commented on "Activities galore for blockbuster match...By Rob Shaw April 27, 2012. ..."
Activities galore for blockbuster match...By Rob Shaw April 27, 2012. A CROWD of around 18,000 is being tipped for tomorrow's AFL blockbuster in Launceston. Hawthorn yesterday confirmed that 14,000 tickets had been presold and, given the favourable weather forecast, anticipated a strong walk-up element taking the crowd to ``between 17,500 and 18,500''. While most seat tickets have been sold, some are likely to remain on game day along with plenty of general admissions. The occasion features the first visit of Sydney for a roster match in Tasmania as well as dual Brownlow Medallist Adam Goodes setting a club appearance record. The Swans remain unbeaten this season while Hawthorn's two losses from four games have both been by less than a goal. Hawthorn has lined up a host of special activities to mark the Anzac Day round match, with the sides continuing the tradition of playing for the Alec Campbell Cup and Frank MacDonald Medal, both named after World War I veterans. To celebrate the first Hawthorn match in Launceston this year, supporters are invited to join mascot Hawka and the Launceston RSL Band to march from City Park to arrive at Aurora Stadium about 12.10pm. A new Tassie Hawks wall of fame will also be unveiled, a display honouring the seven Tasmanian-born Hawthorn premiership players, and fans are further encouraged to join in an orchestrated show of scarves just before the first bounce. 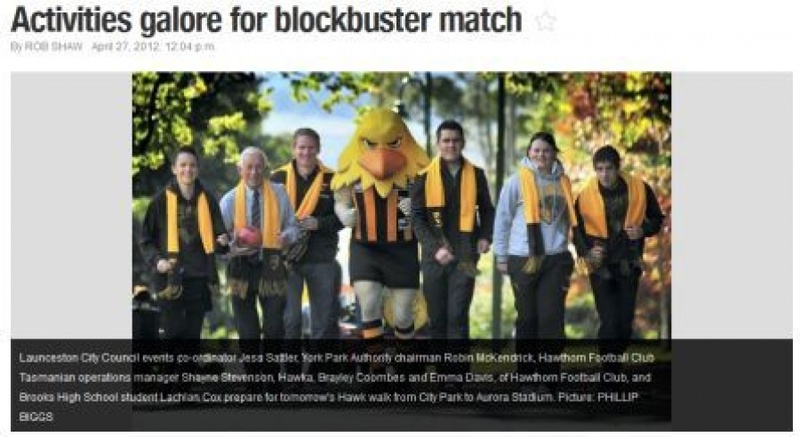 Hawks chief executive Stuart Fox said surpassing last season's record of 8495 Tasmanian members further helped the cause. ``We are trying to build a bit of a coliseum here, make it very brown and gold and Hawthornise the stadium,'' he said. Hawthorn will train at Aurora between 3pm and 5pm today. The Swans will have a closed training session around 1pm with no media or public access. WHAT: AFL round 5, Hawthorn v Sydney. TICKETS: Ticketmaster on 1300 136 122, ticketmaster.com.au or at Theatre North, Brisbane Street.